It's that time again! Performance Assessment Time! I thought I would use this format as it is a program I would like to begin to use more of with students I teach. It allows great versatility and offers others spaces for feedback which is an important part of an assessment. So here it goes! Today we had our first all library personnel meeting of the year. The focus of this was to speak to Library Commons. We had small group discussions about what we felt the library commons was and what it should look like. Then Trish and I sat together to further look at what we are doing in our librries to promote the notion of a library commons. Follow up to this conversation, Trish and I (on Oct. 22nd pm) sat to draft some goals we felt were manageable for our school libraries for this year. This is not carved in stone and will continue to be a working document throughout the year. Heard today that I am due for a Performance Assessment. I will be using Format D as outlined on our divisional site. Spoke with Peter for a short while about this process but will speak with both he and Tanis further. I had the opportunity to attend a library PD today. In all my years I have to say this was probably ONE of the best PD sessions I have ever attended. This day made me think back to my days of "working on my Master's Degree." Some of those similar feelings I experienced during that time flooded my mind today. Feelings of bewilderment, excitement, confusion, validation, anxiety, successfulness! She has created something called a Symbaloo which is like a game board for her presentations and applications that she uses throughout the day. I had been introduced to the program Symbaloo by a fellow teacher-librarian and at that time, the significance of it while teaching didn't click. However, Shannon's explanation for it as a "tool" for my own personal organization of my tools, units of study, strategies, differentiated instruction al strategies, end products etc. along with a multitude of digital devices/tools now has new meaning and its relevance to my life as a teacher-librarian and more importantly a TL at two different schools. Her symbaloo can be found at https://sites.google.com/site/daywithwinnipeg/our-symbaloo-for-today I have not yet started my own but now that I have more info about it, it is on my to-do list. 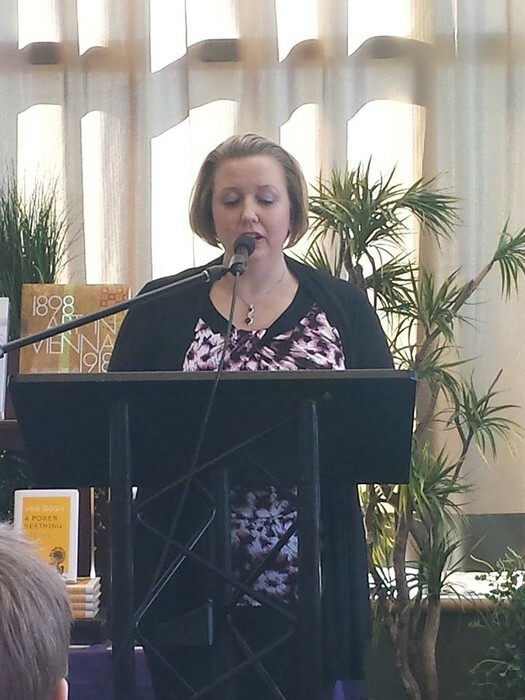 The morning began with her sharing some personal experiences of her teaching life in small town Van Meter, Iowa. She spoke of moving into the library field after years of classroom work sharing some of the similar feelings that I felt today as I sat and listened. We began working in groups on a team building activity about building a structure with very limited supplies. Some people in the group were known to me and others, not at all. Her session entitled "Bringing A New Voice To Libraries, Students & Education Through Makerspaces" intrigued me. I have witnessed personally the change in libraries throughout my 22 year career in the field, but as you know and I know, libraries are changing and will continue to change. So I wondered, what was a makerspace? I learned that a makerspace is an area of our libraries where people can work, design, create and where thinking, play and exploration are critical pieces of that space. The foundation of makerspace is one of constructivism where creation, crafting, design and hands-on experiences are an integral part of the learning. 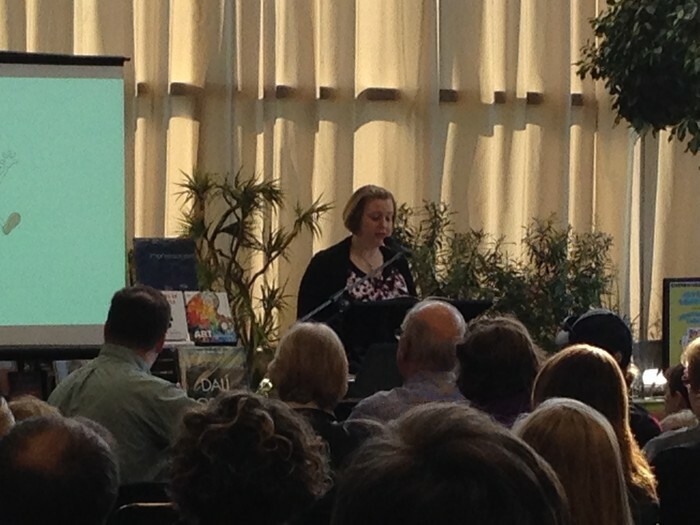 Shannon spoke of an autistic boy at about age 13 with no language came to life when he was introduced to the libraries' makerspace. The introduction of a 3D printer into that space brought him to life. His speech and speaking skills became very evident and it was a space where through his cartooning and the printer, he was able to be a part of his peer group. After a PD and back at school, I think of how this would look in our libraries. I guess in some way, every time we do a research project, there is some element of a makerspace in the student's end product, however, this isn't the right connection in my mind. So when time prevails, Trish and I will sit to see how we can incorporate makerspaces into our libraries. Today I sat down with Kayla (Gr. 2/3 - Emerson) to finalize some ideas for her unit of inquiry that we will begin on Thursday. This is our second meeting. The first meeting was a few weeks ago and it was then we looked at the curriculum for SS at her grade levels and determined we would look at Communities at both the grade 2 and 3 level. We are coming at it from the viewpoint - "If I were to visit this place, what could I expect to find and learn about." 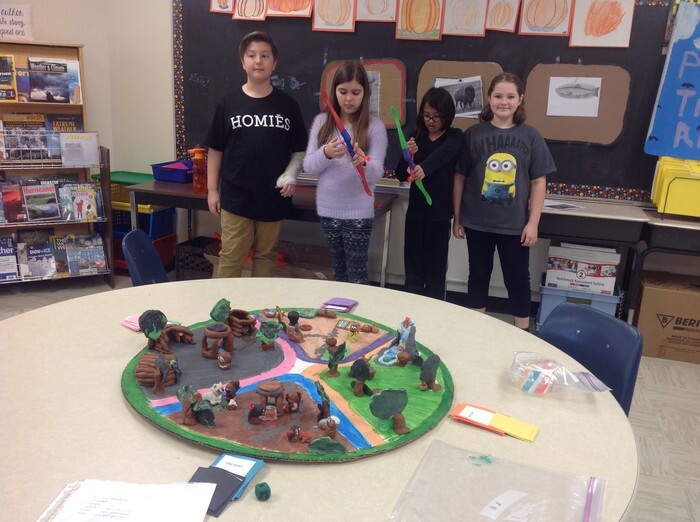 The grade 2's are going to focus on their own community of North Kildonan with Kayla modelling the community of Transcona and the grade 3's are going to zero in on a world community. It is our hope to look at generalizations for all communities to begin with and then branch to separate areas. Some parts of this inquiry will include group work, group discussion and individuals work. Our final project is to complete a book that could be housed in our library. We began our unit by watching some videos and having conversations about what they observed. This was our activating activity. Great conversations between the students and evidence of their listening skills was found during discussions. The first video was done by students approximately the same ages as these kids are. The second video is done by an adult and I fast forwarded it to the beginning of communities and we stopped it when the speaker spoke specifically about a community in the US. Worked on a plan for Teacher Website PD so that all teachers will update their new teacher webpage. Schedule to follow. This is another hat I wear as TL! ICT Coordinator. I enjoy this position as there always seems to be a direct link to my role as TL and my role with technology. Here are the 2 documents that I will use for reference when working with teachers! Today the Grade 1 teacher and I decided to take the kids on a nature walk to incorporate both the Senses unit of study and the Seasons unit. A clip board with one pencil and a data sheet was given to each group of 4 students. As we walked they had to use their 5 senses to determine what they saw, smelled, touched, heard and tasted! Very little tasting! 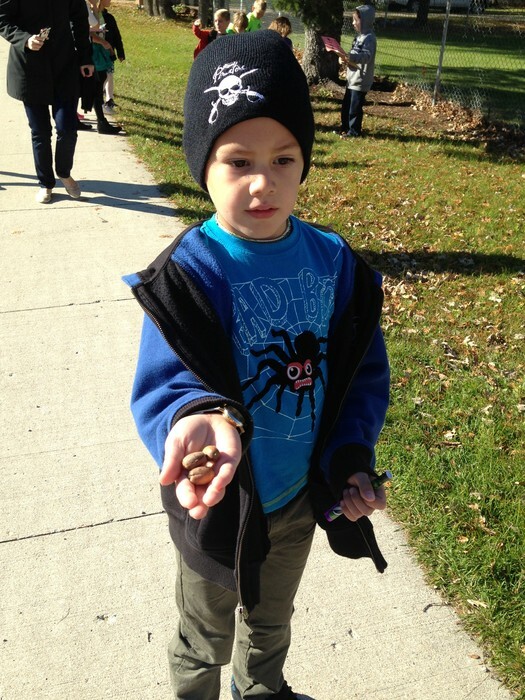 BUT, we walked over to the East St. Paul Community Centre and along the way each group had to "look" for certain things along the walk. If found, they had to circle or mark it on the paper. 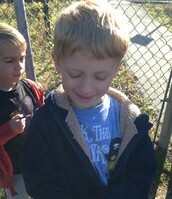 Well as all good activities go, we got side tracked and interestingly we found a geo-cache! 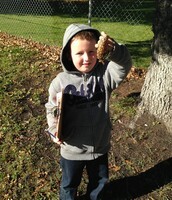 Following the directions of the Geo-Cache App that we used, the kids were able to find the stash. 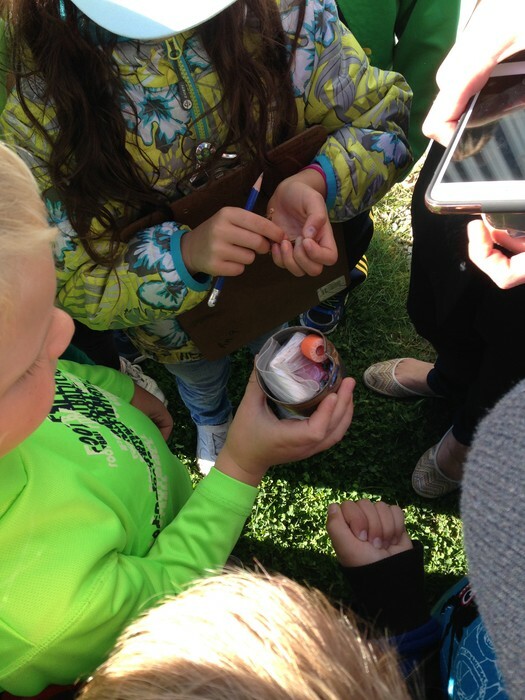 We talked about geo-caching and what happens when we find one. Some students had done this with their families and others not. 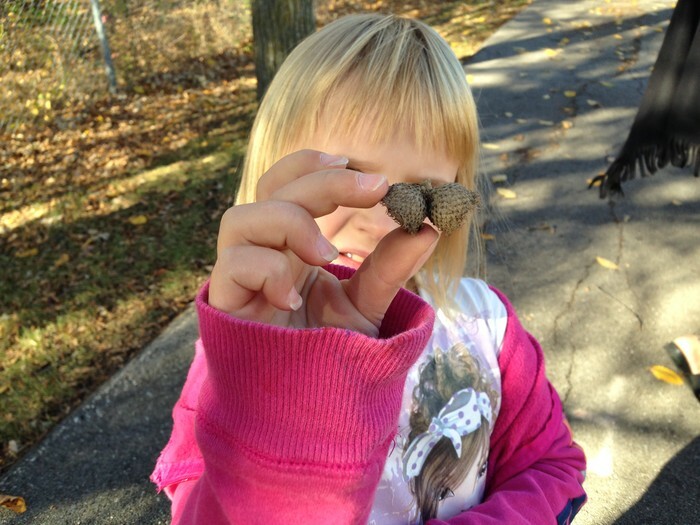 Interesting learning for grade 1's and it all had to do with nature and the seasons. 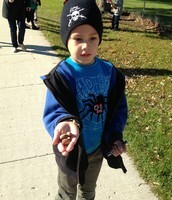 Checking out the goods from the geo-cache! For the past 2 days I have been Teacher-in-Charge at both schools. These days have been relatively quiet. I've had to deal with one incident of aggressive behaviour at EM and I talked to the 3 children involved and we came to a resolution - Hands and Feet to oneself! An incident form was completed for tracking of students as one student has had some issues with behaviours in the past. I decided to have a hands-on learning afternoon that connected to the units of study for the Gr. 4 & 5's at DH. We began our research on Canada's First Peoples and Manitoba's History. I ordered 3 different kits relating to this unit from the ERC and this afternoon we had a gallery walk during their IBL time. The kids loved this hands-on learning and were thrilled with the artifacts. 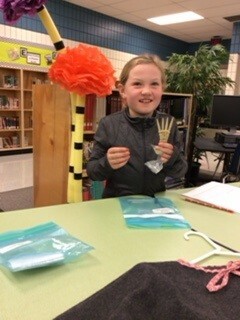 We talked about authenticity, connectedness and importance of these artifacts to the Aboriginal culture. While moving through the centres (4 of them) students worked on a sheet where they had to write down Interesting Facts, Items of Interest, Sketch and label and artifcact of their choice and any questions they had while rotating through the centres. Very positive comments received from students and staff! Took Corinna's students work home to assess. This time we were specifically addressing their ability to make proper jot notes and write the source down where they found their information. 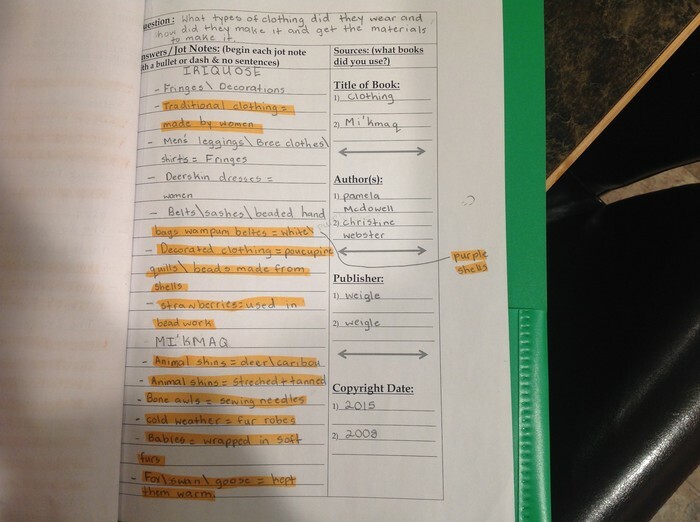 Criteria were established prior to the unit being started regarding jot notes and sources. 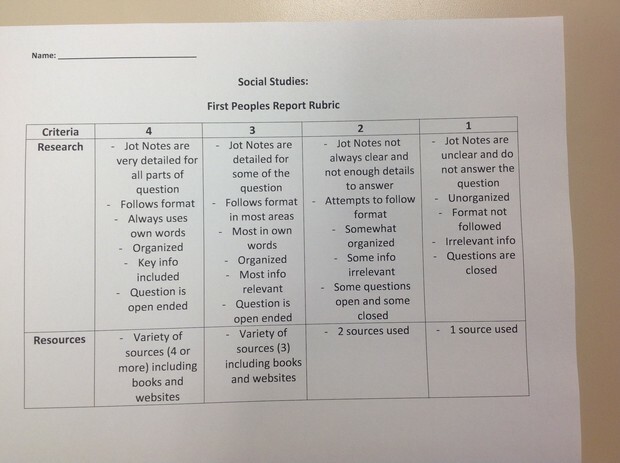 Here is the rubric used. This morning each of the teams at DH had an opportunity to come together with Ruth to look at the On Demand writing samples from the beginning of October done by each classroom. 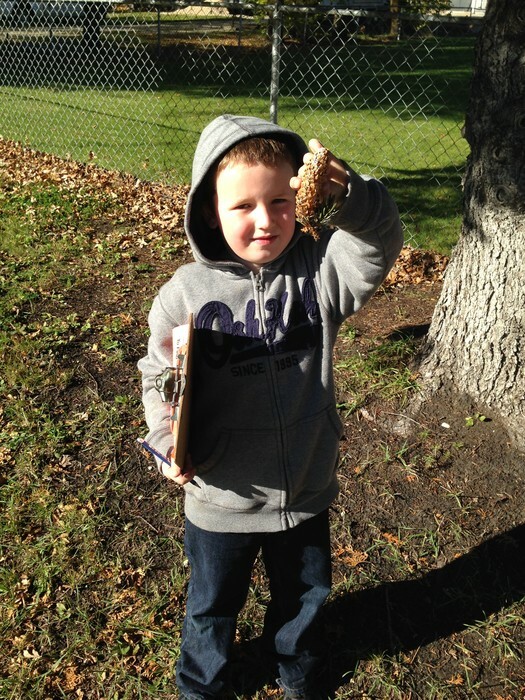 Teachers were asked to bring both typical samples along with an exemplar piece of writing. Initially there wer conversations about the actual writing activity as many found frustrations with this activity and the efforts put into it by the students! Do they actually forget that much over summer? One teacher talked about a study she had read isolating that thought! Conversations revolved around non-negotiables such as capital I and periods at the end of sentences to name a few! At what grade should these be non-negotiables? Next Ruth gave us a piece of writing from one of the students hoping it was not one of their own. We looked at strengths at the pieces of writing done by students in grades 3-5. Ruth gave us a handout taken from the Writing Essentials book that spoke to looking for strengths in writing! After finding the strengths, we put the pieces together with others of the same grade and looked at it in that light. At that point, I left for Emerson school. Will meet with Ruth on October 30 re: Word Walls! Trish and I attended the session focusing on the use of green screen with students to create student generated videos. 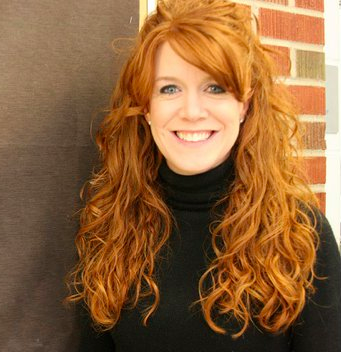 I have an interest in this as Erin C. at DH (teacher of grade 1) and I worked on an IBl unit and part of their demonstration of learning was the creation of a video using an app called Do Ink. At this SAGE session, the app used was Veescope. I downloaded the app while in session and after some instruction about how, why and where they might use it, away we went to create our own videos! I love when I go to a session and come away with something I can use immediately once I am back at school. I have the basics down pat, so I will try it at home before trying it at school. The presenters talked about the importance of getting a good green screen (piece of cloth) in order to have a video that turns out well. Friday morning, Trish and I created a video! When I find out how to embed it here, I will do it. We also purchased a green screen for DH that afternoon off Amazon for a very good price. Got a 9" X 15" green screen or green piece of cloth. Looking forward to making videos. 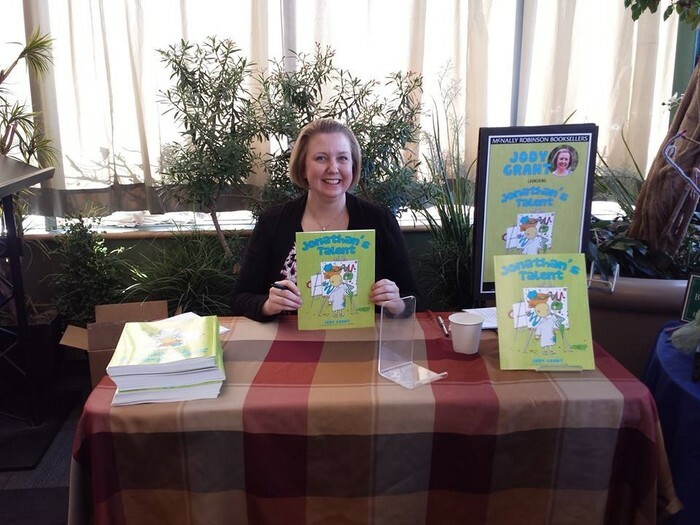 Jody is a fellow teacher at Emerson whose li dream was to write a children's book. Her dream and hard work paid off in her first published "Jonathan's Talent." Book Launch Sunday, October 25th at McNally Robinson's! Talking about her interest in writing a book! Grade 5 at DH have just completed their final projects and I have assessed their jot notes and sources for the classroom teacher. We came up with the rubric based on their conversations with us. This was done as an individual project so everyone received a mark. I love how I get to see the progression of skills from kindergarten through to grade 5. It is truly amazing the skills that students bring to the research process through the grades. Validates what I do with them and what is reinforced during other inquiry with their classroom teacher. Student sample of question and jot notes with sources! At this initial PD, Jason Drysdale spoke and made reference to the Truth and Reconciliation Commission and its impact on all students. The intent is to better inform and make teachers more comfortable, knowledgeable and skilled with regards to Aboriginal education. The PD sessions will focus on: Best Practices, Smudge, Tipi, Seven Sacred Teachings and Stereotyping and Residential Schools. We were given an article and it was broken up into segments for staff to read. We came together as an expert group for one section and discussed what we read. We then came back to our school group to discuss this further. In it we were to address, what I knew about Aboriginal Education, what I knew about EAL Learners, and how they work together. It was an informative afternoon. Corinna and I gave the kids a chance to test their games on groups of people within their classrooms. Below are pics and videos! Very worth while morning of activity and testing. Game Day in Grade 5. I am always happy when I find something new to follow like this new website created by Mackin Resources! Speaks to the need for transformation of school libraries to meet the needs of the 21st century learner. I follow a few different websites, blogs, wikis and I find it interesting how they many times speak to the exact issues facing school libraries today. However, they continually to push for advocacy which allows and perpetuates movement in a positive direction with regards to making our learning spaces exciting yet meeting the needs of all learners, not just the chosen few. How libraries have changed since I was a kid! This becomes especially important when choosing resources for the library including both fiction and non-fiction materials. 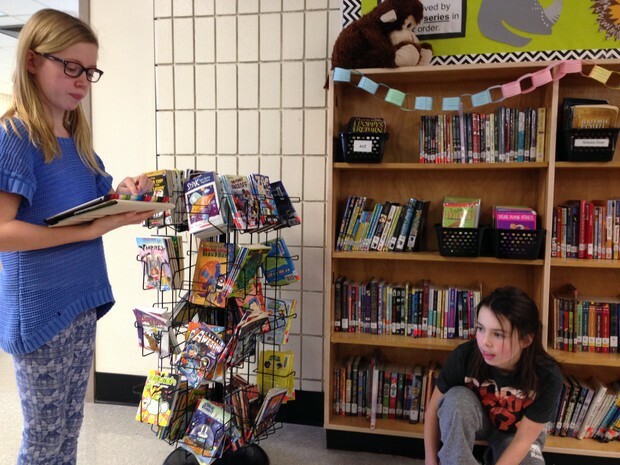 The whole notion of learning spaces and maker spaces has become synonymous with school libraries which is a complete about turn to how libraries used to function. Positive direction for all of us - both educators and learners. Website to check out! Blog I follow! Think I want to check out this site as I am working with the grade 3's on world communities and this may be something I could integrate into our unit of study. As Trish, Erin C. (Grade 1 teacher) and I work to develop an makerspace in the library, I feel reviewing other's spaces will help to connect and reinforce these spaces which is necessary so when creating ours it reflects doing a thorough search of what is out there! I am so looking forward to the creation of this at DH library as it will serve as a hands-on space for children to come together at specific times and allow creativity, communication and collaboration to be seen and heard. There are so many different websites to offer suggestions about creation of this space so it takes a lot of time to digest what we want and need for our space. We are planning to start small and move forward as we see the fruits of our efforts and the positive results within children. I really enjoyed the above article, as it speaks to libraries today and how these "things" called makerspaces fit into them. We are speaking transformation of library space to include more than a collection of books. As I read I tried to make connections for my libraries that are a part of me. Trish and I have talked about creating a library setting that is "in effect, shifting from infrastructure to engagement..." Nothing represents this emerging trend more than the recent growth of makerspaces within libraries." So, the big question that comes with this is HOW???? After Christmas we decided we would have more discussion as to how we see this happening to begin with at Dr. Hamilton initially. At this session, we took part in a smudge and the building of the tipi. Information was given at each session about the significance and the relevance of these ceremonies. I had never taken part in a smudge ceremony and at the beginning felt some reservations about being a part of it. After receiving some information about it, I felt a lot more comfortable in it. I received an email from Kent Brewer, our ICT consultant, making us aware of Code.org. He was wondering if any schools were participating in this international event. I thought about it last year and didn't do it with anyone but I participated myself so I could get the feel of it. So, knowing I had a small clue as to what it was about, I decided to embark on a few teachers that I thought might be interested. Erin Clarke, Jenn Mehyden and Kerry Ann Muzyk! When I want to try something new, I tend to look and seek out teachers who I almost for certain know will respond positively. Of course, these three did and the experience for students and teachers at both schools was and continues to be very positive. Erin and I met and decided how it would look for her classroom. She enrolled her classroom of kids and we set aside 2 periods for every day that I was at Dr. Hamilton. We began by talking about coding and what it is in kid language. We said that right now it might not be something they are even interested in, but it may be something they do once they are done school for a living. Hard for a 6 year old to imagine 14 years from now or so. But ... we entered this mine field slowly and the kids and we were thrilled. Through Erin's connections, we were able to have a representative of Microsoft come out to work with us on our Day of Code. 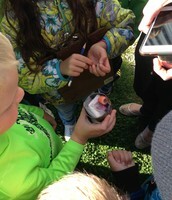 The kids listened intently as she talked about devices and how she uses them in her daily job. Probably the most exciting time for the kids was when we introduced coding through the computer game Minecraft. They were on a high and truly we had all (and I mean everyone) engaged. This was a wonderful first experience with coding for me and children of the elementary school age. I also set time aside for Jenn Mehyden's class of kids to do coding with me. Her kids were also privy to the presentation by the lady from Microsoft and then they too, began their coding experience with the Minecraft coding project. I enrolled her kids and gave them all individual passwords as did Erin with her kids. This way we can track their individual progress. 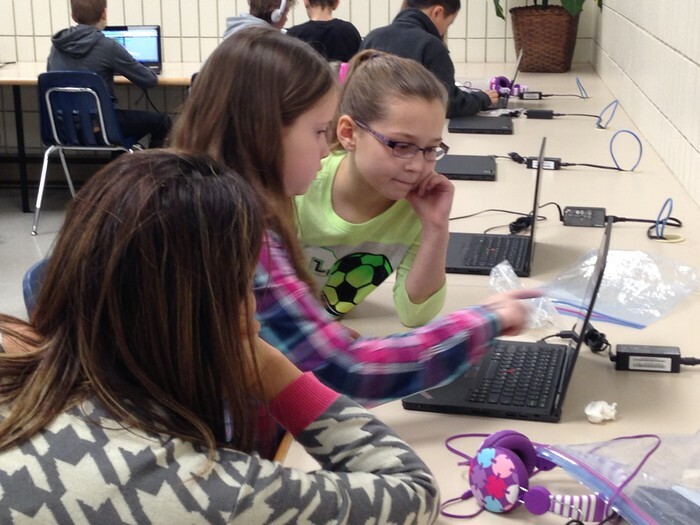 This is a photo of 2 girls from Jenn's class who decided to work together to further themselves with the coding activity as they individually couldn't figure it out. One student is strong academically and the other is weaker in academics. Interestingly though, the weaker of the two, was the one who figured it out. It was an esteem booster for her as I asked her to show the other kids and they were coming up to her for help. These two boys were working together (one the driver or the person to perform the movements on the computer) and the other the passenger (one who helps navigate without touching the screen.) They worked together very well complimenting each other's strengths and weaknesses. The conversations between the students was amazing. 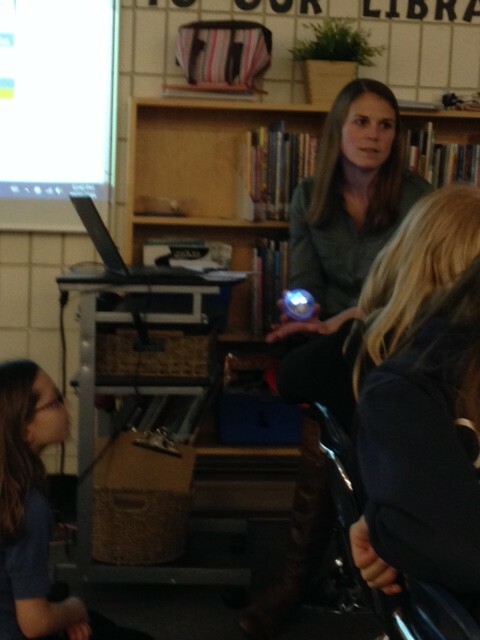 This employee from Microsoft came on our Day of Code and worked with the students in both the Grade 1 and Grade 4 students. She gave a presentation about her job and how it involves coding to create new programs. After setting up a schedule for staff at both schools, I worked with every teaching staff member to update their teacher website. Although the task was not really a complicated one, the teachers were appreciative of the time given to them to update their sites. Their major comment was "Sure hope people look at it more than the last one." After I worked on the teacher website, I spent some time showing them how to save their Documents within their My Documents to One Drive, the cloud storage space. I informed them of the use of Google Chrome to do this versus Internet Explorer. Many teachers started to move files to this new storage area. Any questions from them, I will take to my ICT meeting in January to try to seek out some answers for them. I will work with Michal after break (January 6) as he was busy with Christmas concerts prior to it. Now that Day of Code was behind us, I focused again on establishing my IBL classes for after the Christmas break. At Dr. Hamilton, I will be working with Gr. 2 (Ducharme) on Canadian Communities, Gr. 2/3 (Baran) Canadian Communities and World Communities and Grade 4 (Mehyden) People and Places in Manitoba's History in creating our videos using a brand new program for both Jenn and I. Should be interesting. We will begin with the writing of their scripts right after break. 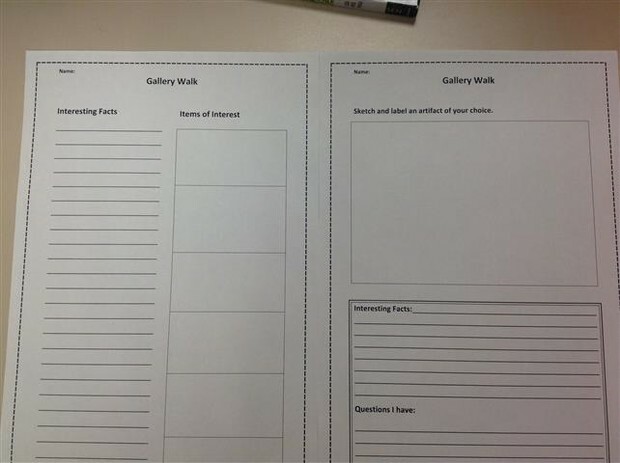 For the grade 2 and 2/3 classes, the teachers and I will model reading information text and making jot notes from it. 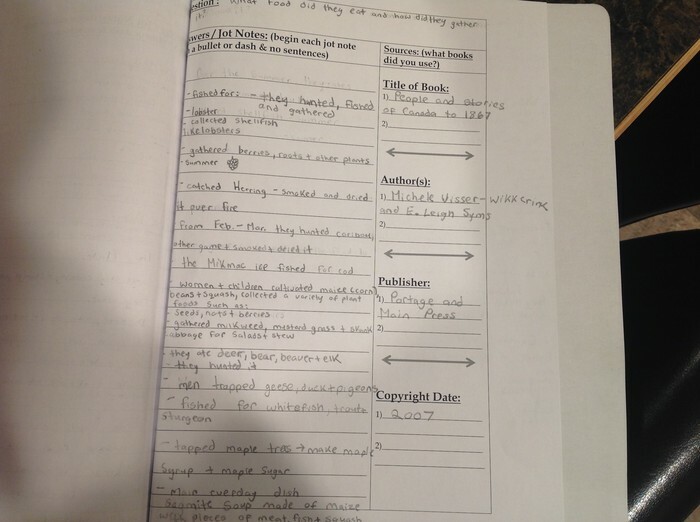 We are using quite a prescript template that I created but at this age, it is essential to narrow down their reading and information seeking in order to gain the skill of proper jot note making. At Emerson, I feel under the gun to get working on the school outcome related to our AAA initiatives. 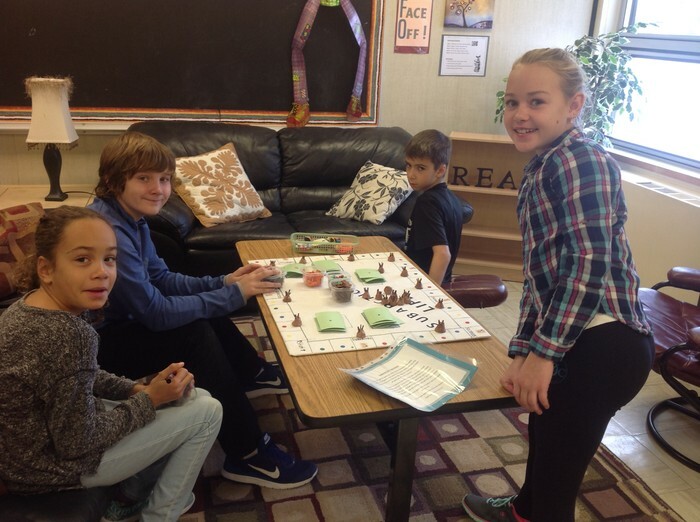 Our outcome is to work with all classes to create a game component connected to our Aboriginal outcomes for Social Studies. So far, I have Corinna's kids done. Krystal's students are slowly moving in that direction but that is not a lot done for it being January. I find the teachers very laid back about this outcome so I will push a little more. After Christmas at Emerson, I am working with Tracy (Gr. 2/3) and Kayla (Gr. 3's as she is working with her grade 2's). Melissa and I spoke before Christmas and she would like me to work with her using the computers to enhance both ELA and Math. On the last day of school before Christmas break, Ruth, Tanis and I met to discuss our upcoming residency at DH and further PLCs for the rest of the year. The teachers chosen are Lisa Ducharme and Joyce Palahnuk. These are two teachers who have taken part in residency but never had it occur in their classrooms. Our focus is on Legends. It also connects to our AAA work with David Delorme set for the week of January 11th. Sherri S. and I and our Literacy Team had met earlier to plan out our Assembly for January 13 pm in which Jody VandeVijsel, a teacher from Emerson who wrote her own book, will come and present to the kids at Dr. Hamilton. Looking forward to that afternoon. Our next Literacy Committee meeting will be January 5 right after break to ensure we have everything planned for that afternoon. Today the three of us sat down to solidify the plans for our Coding Club which is being offered to the Grade 4 and 5 students. Erin's grade 1's are already involved as are Jenn's grade 4's so this will include those kids in grade 4 and 5 that haven't been a part of it. Erin and I chatted on the weekend and exchanged emails regarding a proposal for the SEEDS grant. We completed it through these online conversations and now we have to sit and wait. On Wednesday of this week, I will be speaking with the grade 4 and 5 students and giving them a permission letter with explanation to take home. Coding Club begins next Tuesday at lunch. This winter we are offering Grade 4 & 5 students an opportunity to be a part of our Kids Can Code club at Dr. Hamilton School! 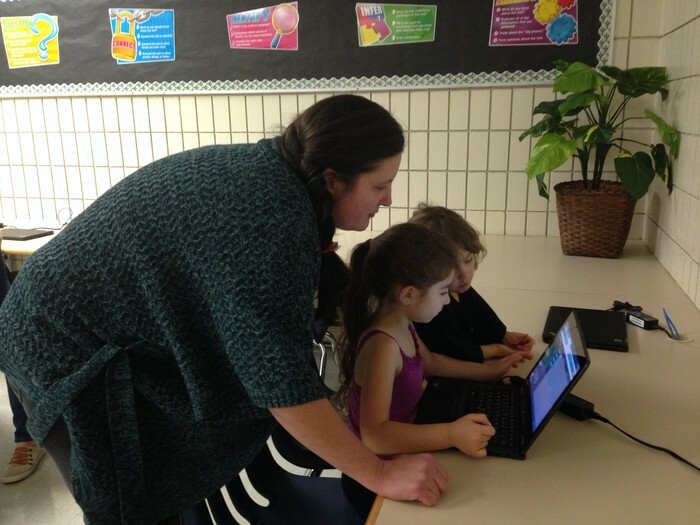 In December Ms. Clarke’s Grade 1s and Ms. Meheyden’s Grade 4s, along with Mrs. Klausen, joined in on the largest learning event in history: The Hour of Code, during Computer Science Education Week. More than 100 million students worldwide took part in this event! The kids in our classes learned how to write code for Minecraft. They LOVED their Hour of Code and so did we! We would like to give more children at our school the opportunity to learn a little bit about computer science and some of the programmable technology available to us. We will use the computer lab, iPads and iPods, a Sphero, and whatever else we can get our hands on to learn and play with. 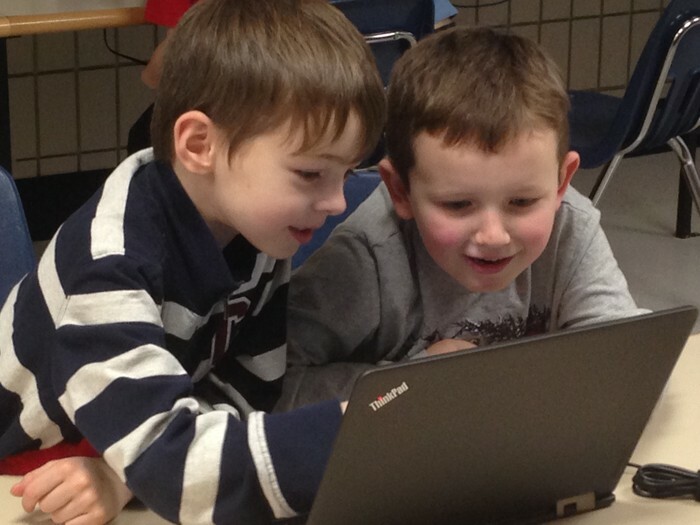 In our club kids will develop their own apps and create games by writing code! The club will meet twice per week on Tuesday and Wednesday for the whole lunch hour (12:15-1:10). Kids will eat their lunches in the library and spend the rest of the time learning to code. If your child would like to participate in our Kids Can Code Club, please sign the attached permission form and return it to school by Friday, January 15, 2016. Our club will meet for the first time on Tuesday, January 19, 2016. Today at our library PD session the topic focused on "Creating a Safe and Caring Environment for our 21st Century Learners." Karen Boyd, a superintendent, reviewed the RETSD's New Gender Identity Guidelines and Library Resource Selection Policies, followed by a presentation by Joan Marshall from McNally Robinson who brought a plethora of books all relating to gender issues some very obvious in nature and others, very obscured. Karen spoke to us regarding the purchasing of new materials related to this topic for our libraries. She specifically mentioned the need for these in all levels and suggested we speak with our administration regarding the purchasing of some of these materials. I will share the list of beginning resources given to us by the presenter from McNally. After these presentations, the afternoon continued with a presentation by Kent Brewer about STEAM Resources. Kent showed us a reason for seeking out members of our staffs to work with regarding this. The significance of educating students and engaging students is critical for them in today's society where the jobs they will be seeking out aren't even know right now. He brought many different gadgets "educational tools" with him for us to explore. I will be emailing Kent after speaking with Erin tomorrow about him coming out to DH to show us some of these gadgets. He also mentioned that he would be able to support us with some of these. I presented Coding with Kids and what I was doing at both schools. DH is further ahead in their pursuit than Emerson but I also have the support of fellow teachers at DH and the support at Emerson is not quite there. We spoke of gathering support from teaching staff when venturing into new fields and the need to gravitate towards certain individuals if we want to get things off the ground. I have to say, I choose wisely when thinking about something that I know I need help with and my own confidence in it, isn't that great. I loved today's PD and I can't say I have said those words often. Because much of today's PD was very relevant in content, the curiosity was great. When I leave a PD session and know I can take things away to use again, it leaves me feeling a sense of accomplishment. 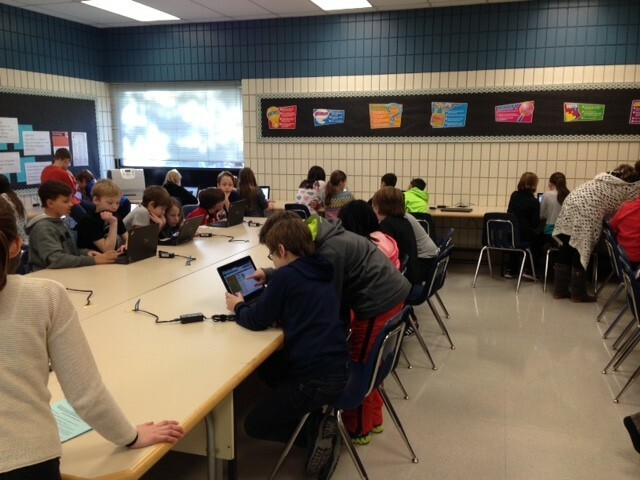 Had our first coding club today at lunch hour and over 50 kids came. Yahoo! I loved to read some of the parent comments on the permission forms we sent out. They are thrilled that we are offering this to the kids. So nice to hear those words of appreciation! Began by inputting their names into Code.org and created user accounts for every student who returned their permission form. Started off this first session with a very poignant video about "What Most Schools Don't Teach?" Next we covered some ground rules including expectations! Then we moved into the computer lab and the kids paired off and we spoke of one being the driver today and one being the navigator and the kids began the coding program with Course 2. Course 1 we said they could do at home. Lots of enthusiasm, great conversations among kids and a very positive experience. Watching a video about why students should learn to code! 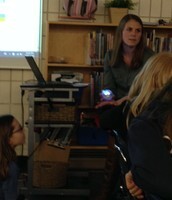 Erin explaining what a Sphero is and what it can be used for! Students paired in the lab and working on Course 2. Little explanation given! Interesting observations! 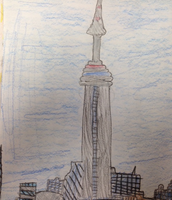 After watching a couple videos about Canada the geography and culture and viewing video clips on Life in Mexico along with I do and we do for jot note making, the kids today finally got started on making their own jot notes. Amber and I let them work for a while and then we brought everyone back to the carpet for some sharing as their exit at the end of class. Had a short glance at their work today and many are on the right track. Will do some reinforcement at the beginning of next class. Also took a picture from a book that used a map and we talked and made jot notes by using the compass on the map. 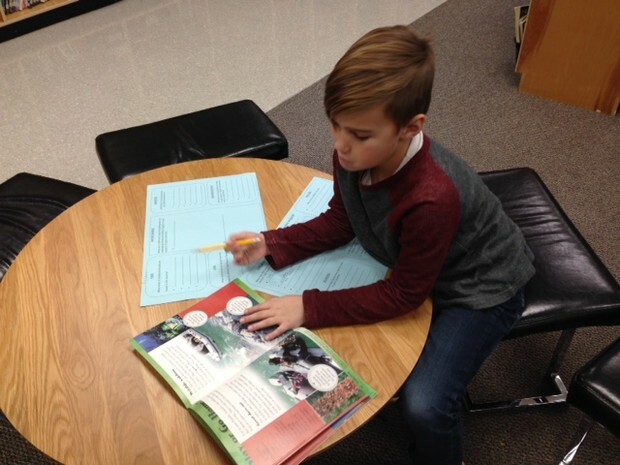 Grade 3 student working on his jot notes using book resources. Sample of jot notes (1st try) from a Grade 3 student. Template created by me after working on Big Ideas as a class! 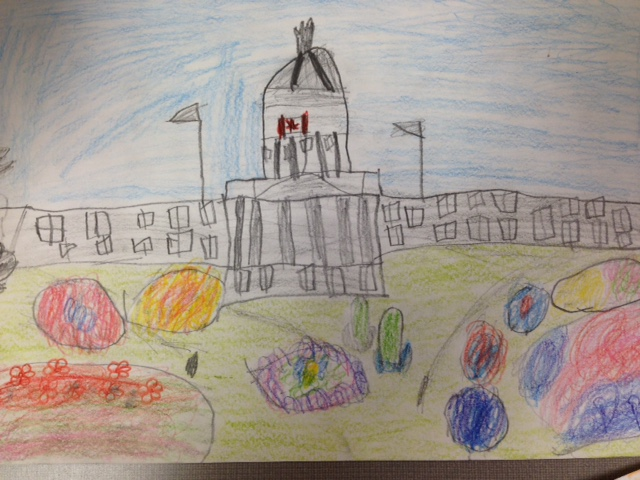 The Grade 4's from Kerry Ann's room have begun their unit of inquiry on Canada's North. 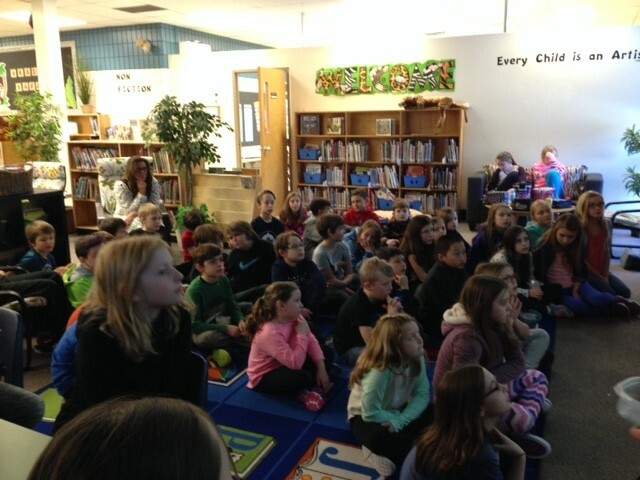 Students began the unit by watching some video clips about general ideas about this area. Students are continuing on the Course 2 materials and now we have 2 spheros to use during club time. They are really enjoying using Lightning Lab which is the App needed during use of the sphero. 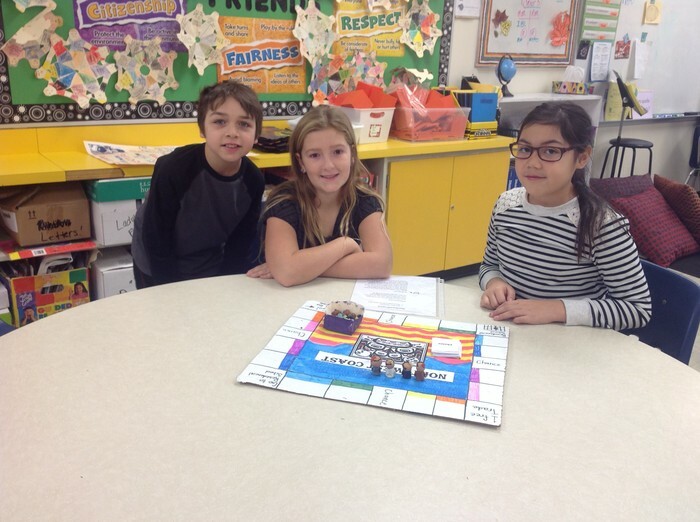 Students have been able to navigate the sphero into many different maze patterns. Our maze tables have just arrived and we look forward to the students using them next week. Attempting to program the robot (Sphero) to maneuver around a series of chairs. I really enjoyed the Professional Development planned by Peter today which was a visit to the Human Rights Museum. Previously I had visited here but it was a personal visit, not one with fellow educators. The conversations were quite different than those I had with my husband on a previous visit. Today as I toured the museum I tried to think of how I could incorporate some new found knowledge into what I do with kids during inquiry. This entire day was filled with inquiry and as we all know, inquiry never stops. The museum is living proof it never stops. Some of the collections at the museum definitely lend themselves to different aspects of the Social Studies curriculum but more importantly, curriculum throughout all grades and throughout all subject areas. I look forward to taking some further visits to decide how I can include information learned into an inquiry unit with fellow staff. In conversation with fellow teacher librarians, it was decided we would sit together sometime this year to see what we could gleam for ourselves into inquiries at different grade levels. Looking forward to this afternoon with them in April. Had the opportunity this pm to meet with Kent Brewer, Divisional ICT, Jenn Pattern-Regier, Conrad (teacher from Donwood), Erin Clarke and Jenn Mehyden (teachers from DH) and administration from both Donwood and DH. The afternoon began with some conversation about how to incorporate new ideas like Makerspaces and Coding into IBL units of inquiry. Kent brought a complete "Tickle Trunk" of goodies that we could incorporate into Coding activities within the Math and Science curriculum. Much conversation circled around STEAM and the incorporation of these subject areas into inquiry. Jenn P. and I have come up with some interesting ideas for structures in Grade 3 and Materials and Objects in Grade 1 so far. It was a wonderful opportunity to meet with teachers who are interested in the same approaches that I am. Looking forward to our next steps as we move forward at DH with our unit on Materials and Objects with the connection to Coding. Started our unit today by watching some YouTube videos from the TV show "How It's Made?" Erin and I sat down to plan this unit and although we worked on a similar unit last year, we decided to change up many of the activities and actually take a different approach to the teaching of this Science unit. So we began our unit by talking and brainstorming about what kinds of materials things or objects of any type could be made. The kids created a list that actually was quite lengthy and we really excited when we said we were going to use many of these materials for them to become inventors. I started a search on Pinterest initially to look for books about inventors, engineering etc. that were fiction though and ones the students could relate to. I wanted to bring in both the materials part of it and the objects. So I searched both school libraries in our division and then online to see what I could find. Erin and I created a Pinterest page so others in our division that we are connected to, might also add to it to aid us in our search. We found many good fiction books such as Iggy Peck, Architect, Rosie Revere, Engineer, What Do You Do With an Idea? along with others. After having students bring in items of different materials from home, we made a Makerspace cart so when we needed materials, they would be available for use. The first area we worked on was a sheet designed by us about characteristics of materials. This morning was our regularly scheduled team meeting at Dr. Hamilton. As upper elementary team leader I coordinated the materials we were going to use for this PD time slot. So following on the heels of what Ruth had worked on with us and using the link Jason Drysdale had forwarded to us, I decided we would read through the information found on the link and then watch the video where Regie explains how to get around writing roadblocks. Short 7 minute video but it provided all of us with some techniques to use in the classroom both for ourselves and our writers. 1) From what you read or watched, what resonates with you the most about this article? 2) What 2 "sure fire ideas" do you feel and believe you do well? 3) Once you are done reading this article, what is 1 wish you have for yourself? The second part of the meeting was an introduction by Erin, Jenn and myself about Dr. Hamilton's Coding Club. We talked to the staff explaining why we decided to start it and the benefits from students being introduced to coding at a young age. We mentioned the connection to the website Code.org and how we are hoping to involve more and more students next year with Day of Code. Teachers for the most part, showed quite a bit of interest and we will see if we have any lookers during our lunch hour of code on Tuesdays and Wednesdays. Today for the PD part of our monthly staff meeting, I took the lead for the meeting as asked by Peter. I began the meeting with my presentation to the staff about AAA PD that 4 staff members are participating in. I included information about the reason for extensive PD as per the division along with providing information about Mindsets about Aboriginal Learners, Tipi Building, Smudges, Sharing Circles and the 7 Sacred Teachings. Further PD is coming up in March. 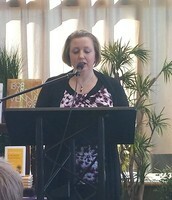 After my presentation, Kerry Ann provided information about Sustainability , followed by Phys. Ed. information and a RETTA request. Kim and I sat down last week to discuss a unit of IBL for her and the kids. She has chosen to work on Animals (Gr. 1) and Animals and their Life Cycles (Gr. 2). Basically, the students will cover much of the same information except the grade 2's need to cover life cycle and its changes for their particular animal. 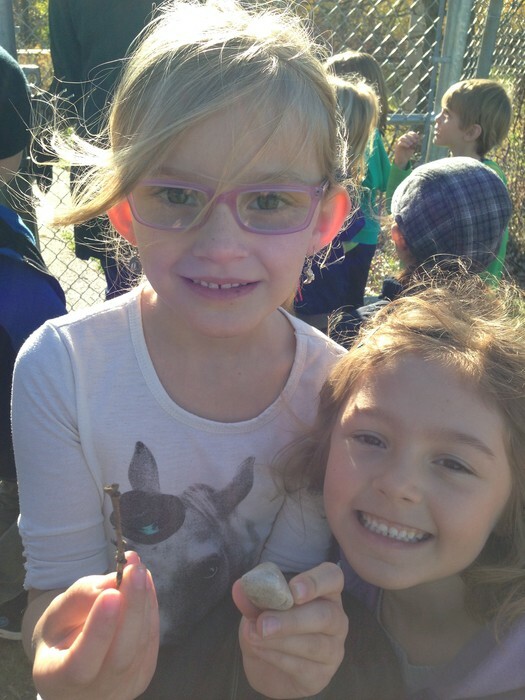 Both grades will cover basic needs including Food, Appearance, Shelters or Habitats, Enemies and Predators and Other Interesting Facts but the grade 2's must also focus in on Life Cycle of their animal. I have crafted some information gathering sheets for each grade and when speaking with Kim we have decided that we will split the grades so I can focus on different skills for each particular grade. For grade 1's we will begin by looking at the books in general as I have pulled many different books covering different animals. 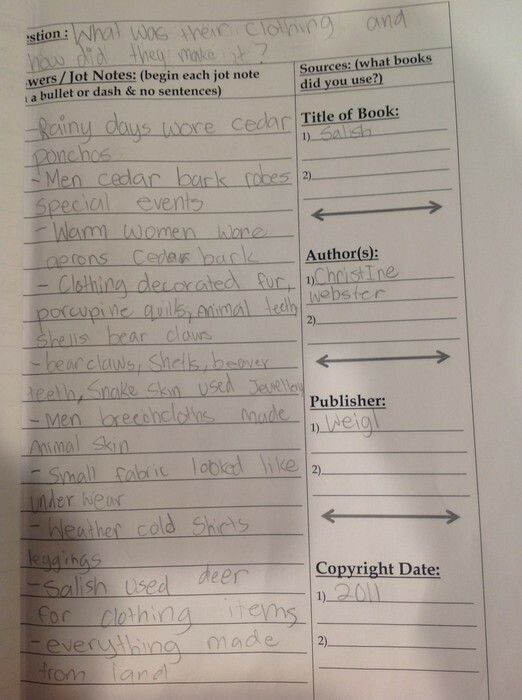 After selecting an animal for research, we will look at the Table of Contents page and then peruse the books to see if they can find some facts about each of the big ideas. I will give them sticky notes so they can label the pages of the book with an A for appearance etc. This will aide them further down during the research process. As there are only 6 grade 1's with varying needs we will use chart paper and once I highlight each animal that they have chosen, I will subdivide the paper to make jot note making easier for them. The grade 2's will look deeper into the how to of doing research and they will do much more independent work throughout the process. However as this may be their first attempt at crafting jot notes, we will take some time to do an" I do" to teach this beginning learning. 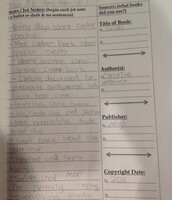 After an I do and then a We do, the students will do a practice sheet prior to beginning their own individual research. 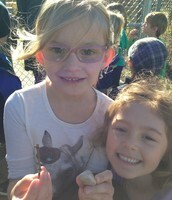 They will be choosing their own animal as did the grade 1's. Choice is very important for success! Thus far, Kim and I haven't talked about a final project, but that will come. Perhaps I would like to use the program Vocaroo which allows them to voice record their research and when done it creates a QR Code with which their parents can use to hear their child's research. Cute new program I found and have used it successfully at Dr. Hamilton! Hope Kim is game for this! Today I had each of the classes individually and we talked about finding information in books. 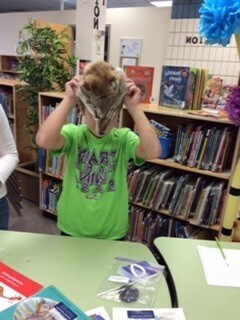 The students perused the books to try to start thinking about an animal they would like to research. Many of them have already chosen one and I gave them instructions to choose something they know little about. They are not to choose something that lives in their homes. We talked about why ... because when we research the habitat of that animal, we would be writing about them in our homes not in their natural habitat. We watched a couple of YouTube videos carefully selected by me as when I searched for some, there were a lot that were very inappropriate and that was without typing anything in the search box having to do with life cycle. We will stand clear of that. Bill Nye the Science Guy has a good video that is age appropriate and they will watch it. 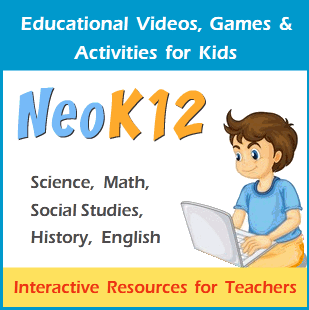 I have also found good videos at neok12.com that are age appropriate and provide curricular content. Ms. Clarke and I started a unit of inquiry today on Materials and Objects from the Grade 1 Science Curriculum. We decided during our planning time that this would be a Makerspace kind of unit - our first of this kind. This is probably one of the best units for this type of learning. Students brought in many, many, many types of things made of all kinds of materials. We talked about objects and the materials that each are made of. The kids decided they wanted to talk about the 3 R's because lots of materials can be made into something else. Erin and I began this unit as we had done in the past by showing them videos found on YouTube of "How Things are Made?" 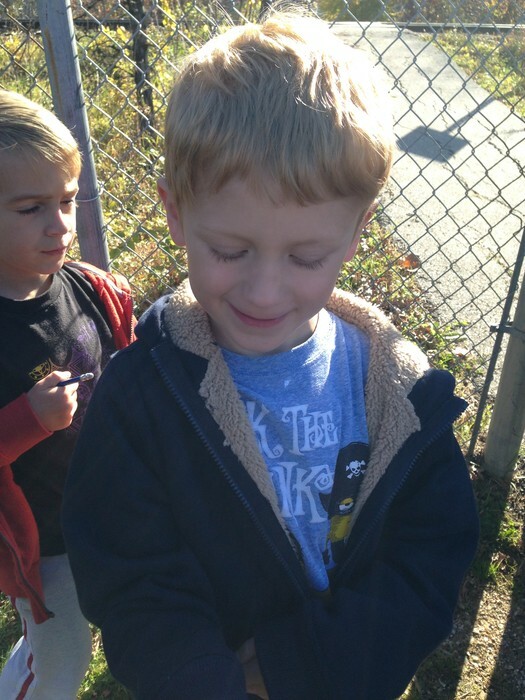 The students enjoyed learning how differently things are made compared to how they initially thought they were. Great learning! 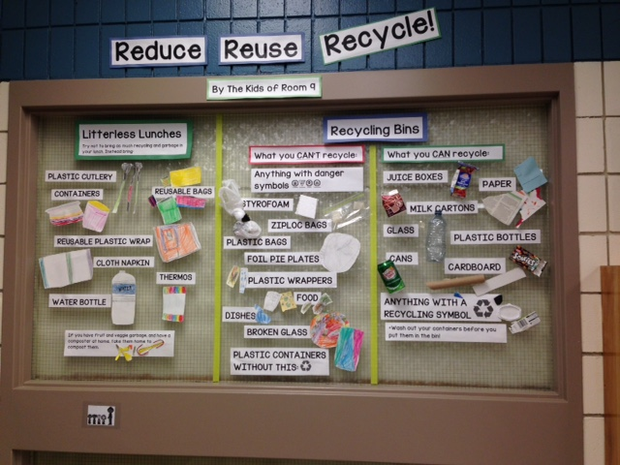 After examining lots of materials and objects, we created a bulletin board using all recycled materials through a daily program of Litterless Lunches. 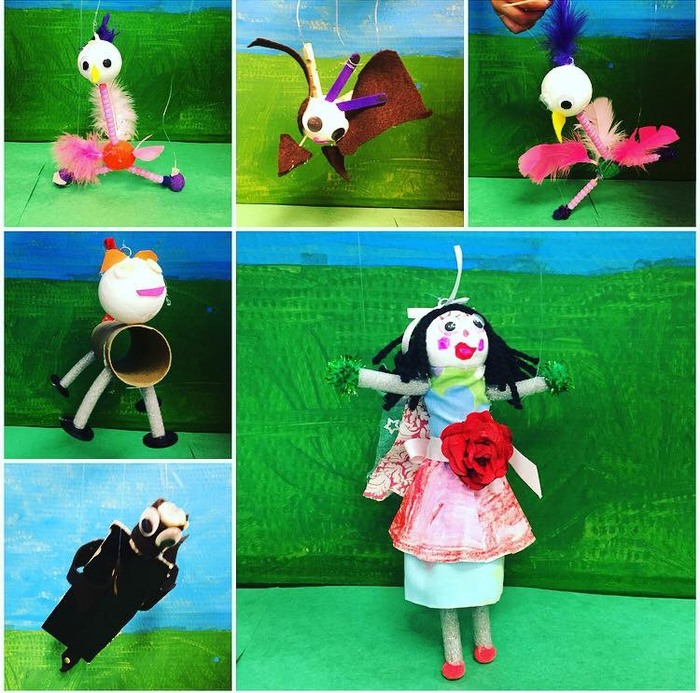 Today we worked on building marionettes which came about from discussion revolving materials and objects and how we can make them move. 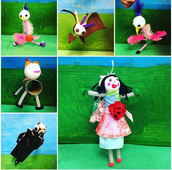 We showed the kids a video on how to create a marionette and they provided the materials (all of which were recycled as this was part of our unit of study) and with very little instruction, they created in pairs their own sketch of what they would like their marionette to look like. Some students chose people figures while others chose animals. When we began the unit, we showed examples of both so the children would understand that movement for people figures might look different than that of an animal. In the video there is explanation about how many parts should be used to create a person and the students who made people figures used this lucky number 13. 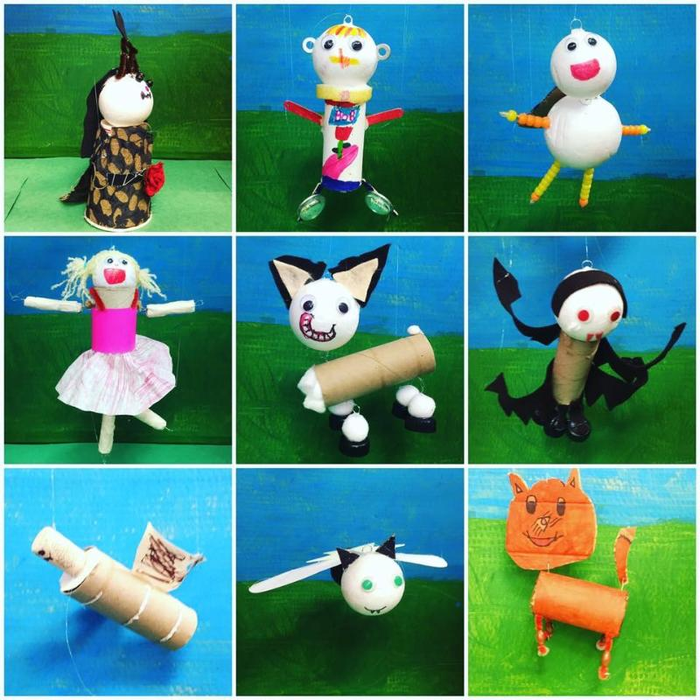 The students who crafted animal marionettes did the number counts on their own. Such a wonderful example of learning. This took about 3 double periods for the kids to completely finish. Getting some hot glue gun help! 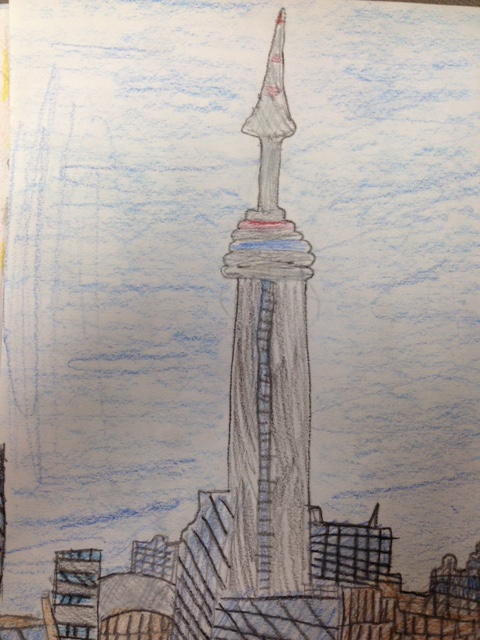 Students in grade 2 did an inquiry about a Canadian place. 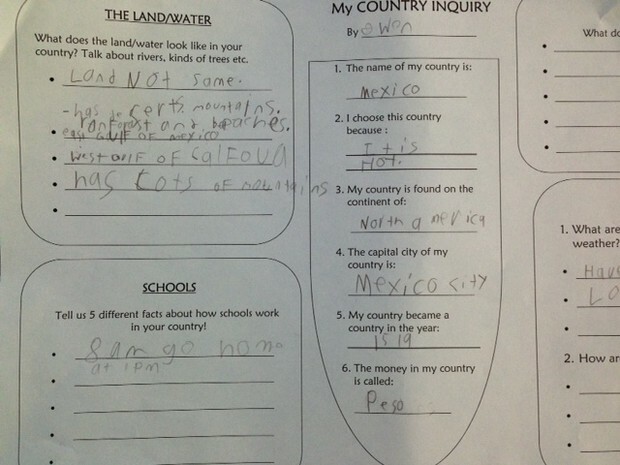 They created jot notes on a variety of big ideas including Land, Waterways, Places of Interest, Jobs, Resources and History. After concluding their jot notes, they found a picture of one specific point from their research and sketched it using the original as a guide. Instruction was given re: using an original as a guide but not using the actual picture. Below are some sketches by students. As a culminating activity, students decided which 6 jot notes best explained their city and using Powerpoint created them and saved them as a picture file. Now that the pictures are complete and the words about their cities are complete, I will make them into a hard covered book for our library. Parents will be given the opportunity to purchase their own books if they choose. Today we started our final inquiry unit in Science with the Grade 5's. I always like keeping one unit until the end of their final time at the school so I can see just how far they have come as inquirers, as information learners, as technological gurus for their age. 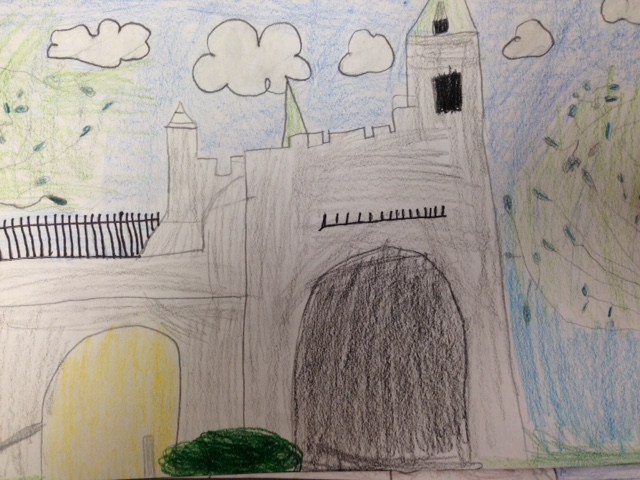 I get to work with the students from K - Grade 5 so I find it very interesting to see their skill set by this time. So ... we began the all important human body unit of study. Of course this unit always proves interesting as it is also a sensitive area unit of study for Health. I began the unit of study by viewing videos of all the different body systems with them. We have a wonderful series of Bill Nye videos on the body systems so we started with this. I then found individual videos about 5 minutes in length that gave many details that at this stage of inquiry, wanted the kids to incorporate into their learning. Lesson on digestion for kids. Digestion is the process by which food and drink are broken down into forms that can be absorbed into the blood. Respiratory system lesson for kids. The lesson shows animation of ventilation and respiration.